Nice, especially the "Big Fun" cover in the second part. I enjoyed this. I don't mind if it's oldschool as long as the screens and motion look good. And they show. Little short, but what's shown is the usual noice quality. Thumb up. rulez added on the 2011-03-07 10:17:07 by JAC! very nice! the old times, again! yes! rulez added on the 2011-03-15 16:41:41 by ɧ4ɾɗվ. Sorry, I don't know much about 8bits machines but do you actually erase the 1123 dots individually ? If so I guess it is not possible to clear 8px spans or 8x8px blocks at once in this graphic mode. :\ ouch! Tricky tricky. @p01: Actually the clearing of a dot is done by clearing a 8x1 block (1 byte, so a single STA instruction). But I still have to do that for each individual dot. Plotting a dot is more expensive, since you have to LDA/ORA/STA it in a byte as another dot might already be in another bit. 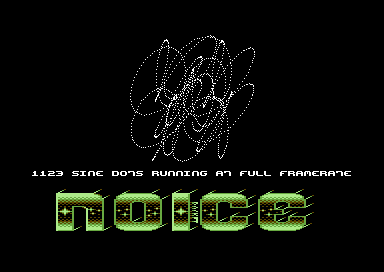 I was wondering 'coz on Atari ST you can display so many dots that it is faster to clear the screen ( well one bitplane ) as a whole rather than clearing the dots one by one. Quite cool, nice oldschool vibes. ..probably really simplifies the x/y->screen mem address conversion aswell :) Thinking out loud.. Indeed a 128 x 128 area is quite small and gives at most: 128 / 8 * 128 = 2048 bytes to clear in a brute force clearing code. Again I don't know 6502 assembler but it seems that in this case, a brute force clearing would be faster than clearing the dots one by one ( which means "computing" their position ). A series of STA $address 4 cycles. 2048 * 4 = 8192 cycles. 8192 / 1123 = 7.29. This would be similar to spend around 7 cycles per dot erase. I think a fast routine would be something like a series of STA $address, X per dot which is 5 cycles. I am not entirely sure, I was thinking of this kind of dot rendering (stationary on X, oscillating on Y). Should not be STA $address,X but most probably STA (zero page),Y where in the zero page some_C64_Y_address(SIN(t)) is stored and Y moves you on x coord. You may only have to scroll these addresses inside the zero page after each frame but that's just 254 bytes. There gotta be other ways with this, gotta try to test before thinking in theory. But in any case it's less than 7 cycles. I have noticed the pattern that made me original think the dots were symmetric. They are not but you see a similarity in four quadrants, maybe because the sine is small to fit in zero page if this is how I think it's done here. So to plot it takes 4+2+4 = 12 cycles per dot + some additional fraction for loading new sine values. So to plot it takes 4 cycles per dot + some additional fraction for loading new sine values. So unless I plot like well over 1500 dots, it's still cheaper to clear the dots instead of clearing the whole 2048 byte area. And to clear it takes 4 cycles per dot + some additional fraction for loading new sine values. page created in 0.016565 seconds with 15 queries.